^ Staite, Jewel (2004). "Kaylee speaks: Jewel Staite on Firefly". In Jane Espenson, Glenn Yeffeth (ed.). 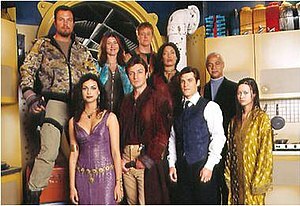 Finding Serenity, anti-heroes, lost shepherds and space hookers in Joss Whedon's Firefly. Dallas: BenBella books. p. 227. ISBN 1-932100-43-1. PN1992.77.F54F56 2005.